An ex-voto from 2008. 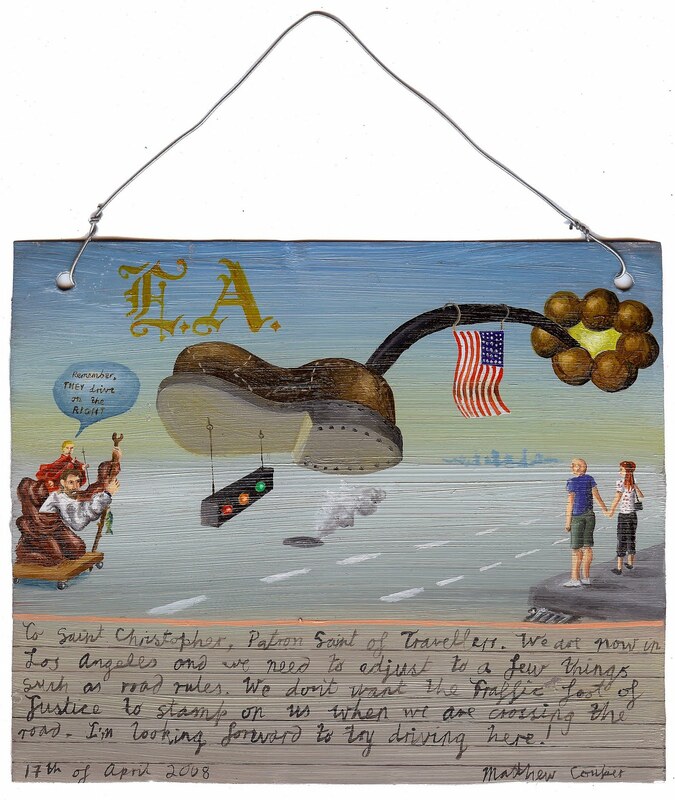 This was the first ex-voto I painted in USA. I broke my rule of 'painting-on-the-day' as it was a bit hard to paint in a small hotel room, so I did the drawings in my sketchbook and completed an almost day-by-day account of our time in LA when we arrived in Las Vegas. I feels odd and cool to be sitting at the same table I painted this ex-voto over two years ago. I'm going to have to get painting again and complete some back-dated ex-votos of our life so far in USA: looking for a car, catching up with old friends, travelling, life on the road, looking after pets, attempting to transport artworks internationally, working out the best health, car and life insurance. This is where the ex-votos become quite cathartic for me, a stress relief and a good way to look back on the trials we faced to get our lives sorted. This ex-voto features St. Christopher, patron saint of travellers. I'll have to reconfigure this idea as we're not really travellers anymore.